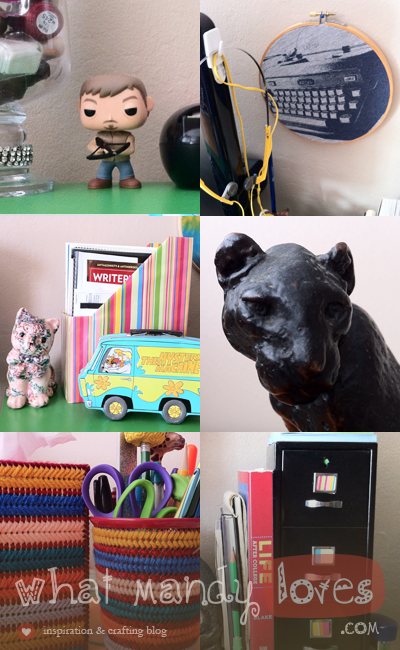 I have so much stuff I wanna share with y'all, but the more I collect items for future posts I started to see patterns. So starting this month (and however many months in the future I feel like doing this) I'm doing THEMED MONTHS YAY! Despite the capitalized excitement however, not much will change, so yay? 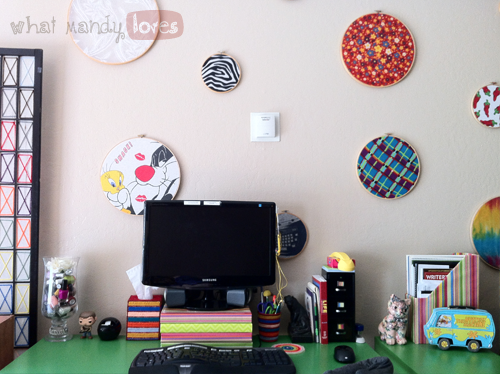 This month is my office, which is my cute little desk space smooshed into my studio apartment (taking up most of my living space) where the magic of What Mandy Loves and my other projects happen - the perfect first theme to show off where WML is created. Throughout the month I will spotlight projects & items as usual with my DIY, Finds & Treasures, and Tips posts so don't expect any format changes. June's theme includes ways to unite your office supplies and will highlight a few quirky things that make my desk space unique. View the caption of the photo below for details and links which will be updated later on in the month.